For reasons unknown, with the exception of Midas I don't believe anyone other than I have even mentioned Mr. D's Shish-Kabobs on this site. I have always felt the Mr. D's Fries are some of the best if not the best in the city. ( I haven't found any better as yet) Today's Trib Play section pays homage to the Best Fries in the City with Mr. D's finishing 2nd behind 5 Guy's (which I personally don't think are all that great). Fries are included with every sandwich and now that everyone knows that these are destination Fries, I suggest the Steak Sandwich with cheese, grilled onions and tomatos. Good for them. I had actually stopped in for lunch today, me and 300 cops. it's kinda sorta well known to those in the area. i've even seen it mentioned previously on LTH. i've had the fries b4 and thought they were good, but never thought that it would ever get love in the Trib. oh, btw, Mr. D's Shish-Kabobs' shish-kabobs are really good. 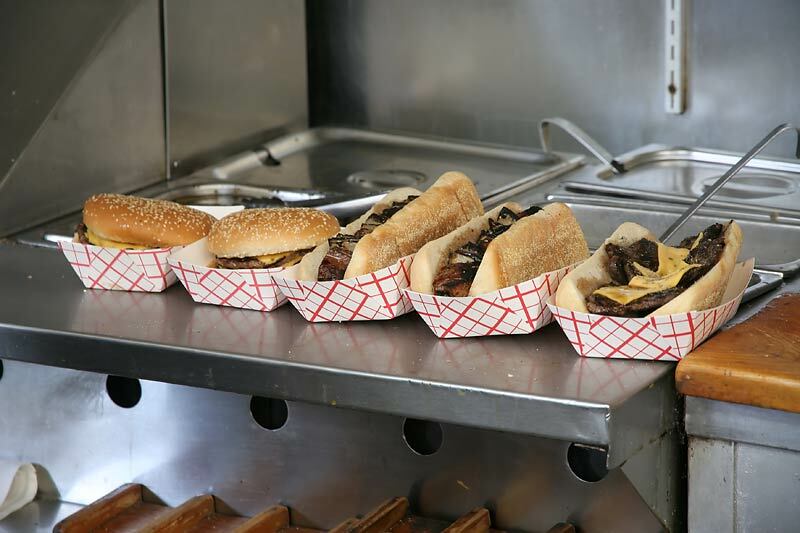 And the steak sandwiches are even better. Nothing beats watching the rhythm of the guy going to the fridge, grabbing a slab of raw meat, tossing it on the grill, then dividing his time between there, the pile of freshly cut potatoes, the oil and a few sprinkled seasonings, all while chatting to his buddies drinking coffee in the corner. Mr. D's even has wrapping it all in a brown paper bag to go down to a science. Well I won't argue about whether the steak sand. is better than the shish-kabob, I like both. But I usually get the shish-kabob. Both are marinated and share a lot of the same taste profile. You can't go wrong with either. But my wife is going to have a coronary when she reads this. She hates the place. The first time I took her there someone ordered a burger. Mike walked over to the cooler and grabbed a patty. Without even turning around Mike tossed the patty like a frisbee landing perfectly on the grill. My wife said, "I'm not eating anywhere where they throw the food around." The next I talked into giving it another chance, Mike was tending to the fries. He dropped the tongs on the floor. It was busy and he didn't miss a beat. He just kicked the one on the floor to the side so he wouldn't step on it and grabbed another pair kept on cooking, kind of like a drummer that loses a drum stick. But she found that offensive too. She's refused to go there since. And even though Mike is a really nice guy, he usually looks very stoic leading her to refer to him as the 'Shish-Kabob Nazi' in reference to the Seinfeld character. Needless to say, her distaste for the place hasn't stopped me from going there. I've been going there for 15 years. If she gave me an ultimatum, her or Mr. D's, well, let's just say it wouldn't be a snap decision. I don't know if they're the best fries in the city, but I know 5 Guys shouldn't even be in the same article. I haven't seen the paper yet, but I saw picture on the web page. Let me say, if you've never been there, the picture they show is awful. In real life, they are some of the best looking fries you'll ever see. They look like they are going to be fantastic and they don't disappoint. Just don't go in there expecting ambiance. The article tried to describe the lack of decor, but it's much worse than described. I'm a huge fan of Mr. D's - I actually always get the cheeseburger - and yes, LOVE their real potato, hand-cut, twice-fried frites. Mr. D's is the place I dream of when I'm stuck in cheeseburger-and-fries forsaken places like Paris and Spain. NAV MAN and NAV WOMAN are going for a kabob run tomorrow night before she goes to Vegas thursday morning. One of the best two man opperations between Oak Park/Central and Grand/Belmont. Cheetos are my favorite snack atm. I love Mr D's and the marinade they use for the kabobs. I love the flavor. I also think they use the same marinade on the char grilled hamburgers. My question is do they use pork or beef for the kabobs? BTW, awesome fries! SouthSideMike wrote: I love Mr D's and the marinade they use for the kabobs. I love the flavor. I also think they use the same marinade on the char grilled hamburgers. My question is do they use pork or beef for the kabobs? BTW, awesome fries! It's beef, no doubt. I don't think they use the same marinade on the burgers, but they use it on the steak sandwich. Just a heads up, they are closed for their annual vacation. I didn't get to read the sign in the window as I was across the street. Nice piece on Mr. D's on Chicago Best last night for their steal sandwich. Not sure it really ranks with the best, but still good to see them get a little pub. Mr. D's Shish-Kabobs has been nominated as a Great Neighborhood Restaurant. Please discuss the nomination in this thread. Discussion ends on March 7. I've been a long time lurker and finally registered so I could chime in about Mr. D's. 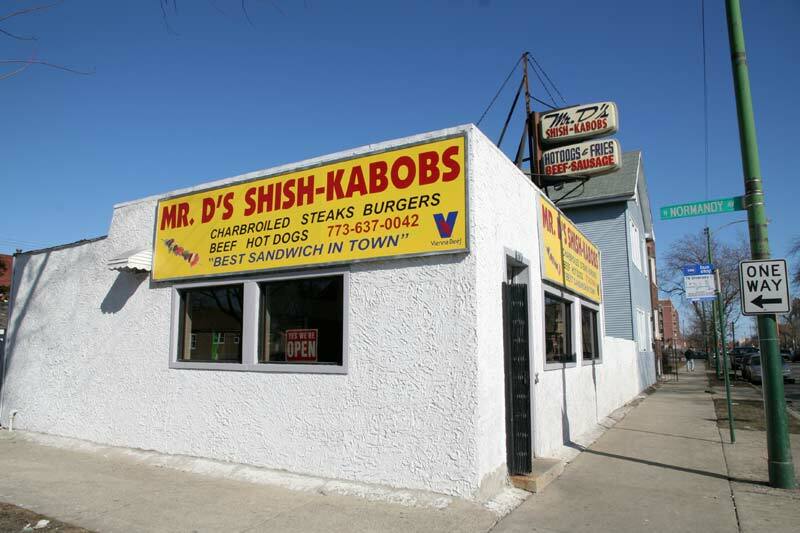 I lived a block away from Mr. D's for over 25 years and would often walk to the corner to get steak sandwiches or kabobs. My wife loved the kabobs and she usually doesn't like meat. I would ALWAYS get the steak sandwich which was fantastic. The marinade was right on. Great fries as well. I think midas put it most eloquently and I can't add much other than a big thumbs up for Mr. D's as a GNR! I don't think I've ever posted about Mr. D's, but I love the place to death. 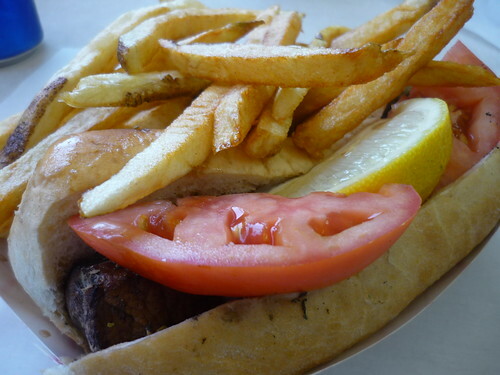 I wish the hours were more convenient, but boy do I love the shish kabob sandwich and the fries. I don't have a dog in this hunt one way or the other, but is there any track record of this place other than this very short thread? besides this LTH thread, Mr. D's has been featured on "Chicago's Best" television program. also, as previously mentioned in this thread, Mr. D's has been featured in a May 2009 Chicago Tribune article regarding best french fries in Chicago. lastly, in my personal opinion for whatever it's worth, Mr. D's is on par w/ many of the other fast food/burger/hot dog joints that are regularly mentioned as LTH favorites. 10after10 wrote: besides this LTH thread, Mr. D's has been featured on "Chicago's Best" television program. also, as previously mentioned in this thread, Mr. D's has been featured in a May 2009 Chicago Tribune article regarding best french fries in Chicago. lastly, in my personal opinion for whatever it's worth, Mr. D's is on par w/ many of the other fast food/burger/hot dog joints that are regularly mentioned as LTH favorites. Your personal opinion, because it is posted here, is worth a quite a bit. As for the rest of the mentions you cite, they don't really factor into GNR worthiness. Please, check the GNR Guidelines for further clarification of the process. jesteinf wrote: I don't have a dog in this hunt one way or the other, but is there any track record of this place other than this very short thread? As I noted in my nomination post, the LTH search engine cannot search on just Mr. D's. Still, putting in the address, I was able to link to several different threads, including this one, that came up via search. In addition to those threads, I also linked to Da Beef's blog post on the place, which should count somewhat. I did not, however, link to my 2005 post from my old blog because I figured that counted for nothing. 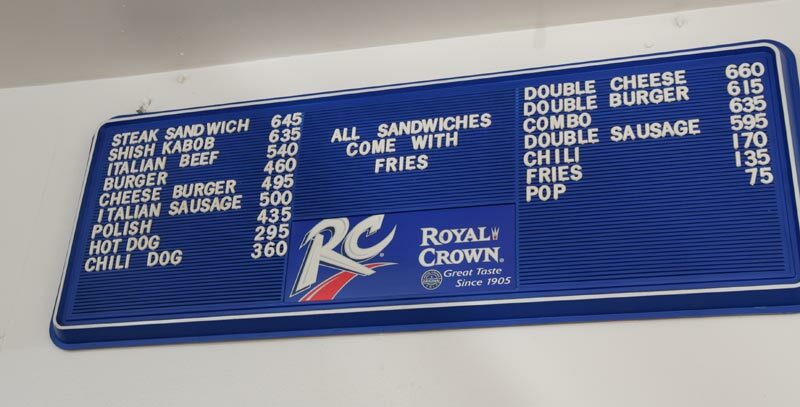 It is my general sense that Mr. D comes up a lot on threads of where to eat around Oak Park and where to eat very good fries, but it is hard to specifically track down all of these cites. It is, probably, a job for Ed F.
Hearty thumbs up on this nomination. I once went here when neighborhood regulars were gamely trying to guess the age of the oil the fries were cooked in, all while the stone faced main guy - Mr. D? - went through his well-honed motions of preparing one of his deceptively simple yet always delicious sandwiches. He eventually revealed the correct answer, btw, but I don't remember! I was there for the first time a few weeks ago. I had the steak sandwich with fries. The steak had that great char taste that I love without being dried out or overcooked. The fries were perfectly crisp right out of the fryer. It deserves a nomination,imo. I am 100% behind the nomination of Mr. D and his almighty sandwiches. Unless you live in a meat (and shoes) free community in Arcata, California then this is the type of lunch spot you want in your neighborhood. The menu is great and everything is good. There's so many streets and sans type spots like this in Chicago but so few do it like D's does. I've had an unmeasurable amount of sandwiches from an excessive amount of spots around Chicago and if you asked me to come up with a top ten or "best in city" etc...type list, there is no doubt the shish kebob would be included. It is what it is so don't expect some Grahamwich like concoction and that includes the price of the thing. 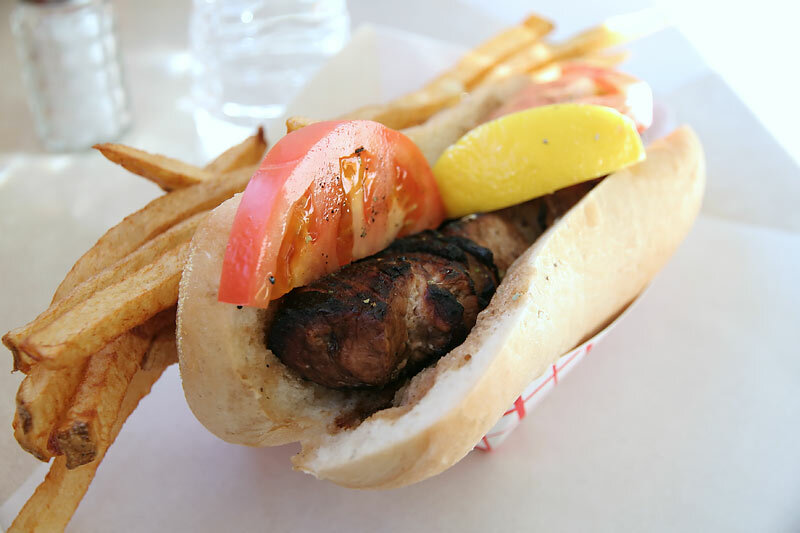 What you can count on is a perfectly grilled shish kebab placed into a sandwich roll and then topped with gravy in the same way a beef is, top that with their first rate fries and you got yourself one hell of a lunch from "a couple who care". I confirm the choice of Mr. D's as a GNR. The only reason I do not go there three times a week is the fear of eating fries that often will do bad things to my waistline and arteries. Mr. D behind the grill is ballet. Simple spare movements. The steak sandwich is amazing. The menu is small but everything is done spot-on. Every hot dog/kabob stand should be this good. Just extra care taken with every step. THe man is a pro. One day Mr. D will be gone and we will all wonder why we did not honor the man while he is still here. This is our chance. Based the current GNR nomination, I made my first trip out to Mr. D's yesterday . . . Straightforward and to this life-long Chicagolander, as tantalizing as it comes. I loved the old school feel of this place. A few customers were wearing what appeared to be pajamas. Others were wearing slippers. This is a neighborhood spot if there ever was one. Not our order but a nice array of sammiches. I really enjoyed the sandwich, though I should have known better and skipped the tomatoes. The meat was nicely charred and flavorful not only from the char but a really nice marinade. Very tender and tasty steak, which greatly exceeded my expectations, and nice fresh bread, too. The only negative aspect of our visit was the fries, which were soggy and slightly undercooked. We ran into LTHer gleam and had lunch with him. He's a regular at Mr. D's and commented that it was unusually busy. He thought this might have had an impact on the fries. They were still tasty but after reading so much here about how great they are, I'd be lying if I said I wasn't a little disappointed in them. That said, Mr. D's just seems like a perfect place to get one's grub on. I'd go back in a heartbeat, even if it meant possibly reducing the overall number of those beats I'd get to experience. Even as we were leaving, I felt like getting back in line and ordering a cheeseburger for the road. However, being the first of several eating stops planned for the day, it just wasn't in the cards. But Mr. D, I'll be back. I support ths nimination for Mr D's completely - I LOVE this place. I prefer the shish kabob to the steak but they're both damn good. I've never had bad fries there. They do vary a bit from visit to visit but in my experience it's usually a variation between "quite good" and "DAMN those are good"
Last edited by zoid on February 20th, 2011, 5:22 pm, edited 1 time in total. I was at Mr. D's yesterday, too. A friendly regular also commented the fries were a bit off, too. He speculated the oil might not have been as hot as it should be. While the fries were fresh from the fryer, they were limp. Sometimes when I get fries like these, I wonder about their cooking method: cooked all in one-go or the two-step fry? It seemed like it was cooked all in one go. I went for fully dressed steak and pork kebab sandwiches, that is with tomato and onion. While it was a winter tomato, it was an unusually generous thick slice. I salted the tomato a bit and ate it anyway. 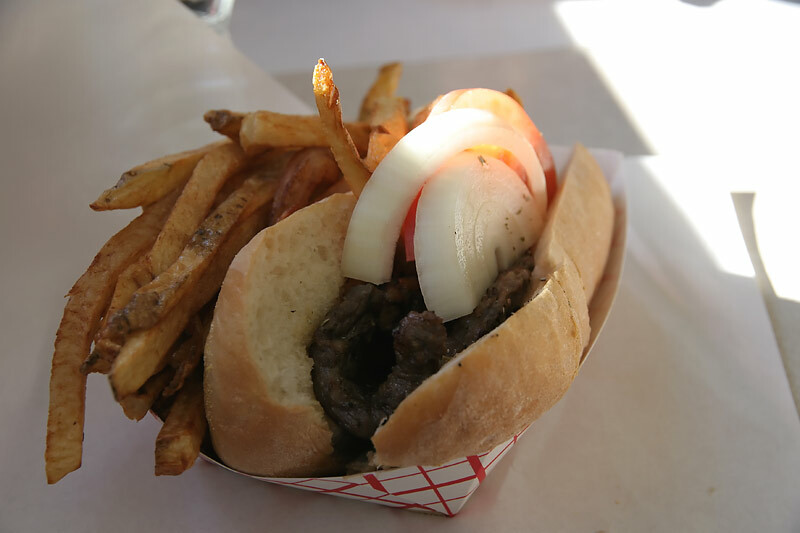 I noticed they ladled meat gravy onto the steak sandwich's bread, which added to the beefy flavor. Just enough to wet the bread and yet not over saturate it. I liked the way the fries were arranged next to the sandwich all laying very neatly on their sides. Picking up your sandwich caused the fries to tumble into the gap and loose their even profile. The hamburgers at other tables were irresistable. If there had been a third person present, this would have been an excellent addition to the order. From the continuous flow of customers, this is already a Great Neighborhood Restaurant. I've obviously been to Mr. D's a lot. I've never seen the fries not be double fried. 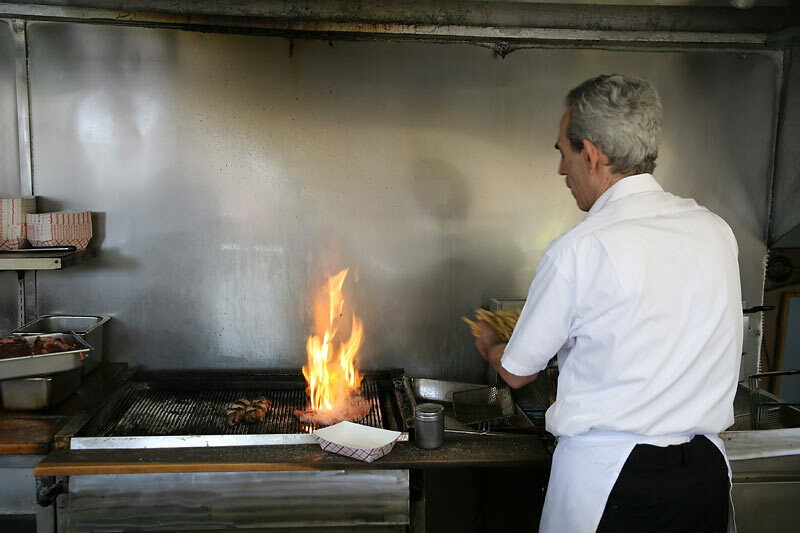 However, when it get really busy, I suspect the sheer volume of fries that Mike has to cook starts to bring down the temperature of the oil itself. It's a delicate balance. midas wrote: I've obviously been to Mr. D's a lot. I've never seen the fries not be double fried. However, when it get really busy, I suspect the sheer volume of fries that Mike has to cook starts to bring down the temperature of the oil itself. It's a delicate balance. The issue of customer volume and oil temperature was exactly this regular's opinion, too.